Jane Peterson. Flowering Carob Tree, San Giorgio Maggiore Island, Venice. Oil on canvas. [Flowering Carob Tree, San Giorgio Maggiore Island, Venice]. c. 1914. Oil on canvas. 18 x 24 (framed 27 x 32 1/2). Exhibited at the Newport Art Museum and Art Association, June 11, 2011 to October 16, 2011. 'Remembering the Ladies: Women and the Art Association of Newport. Signed "Jane Peterson" lower right. Housed in an elegant gold leaf French style frame, with a linen liner and a gold lip. $25,000. Jane Peterson's most innovative period was from 1910 to 1930. During this time she produced her most important work. Her trips to Venice resulted in exhuberant paintings full of glowing color. This painting is from that period. The brushwork is bold and exciting. The bright round yellow carob flowers contrast with the vertical mauve carob pods. The trunks and branches of the trees form a series of triangles that reflect the lush mediterannean landscape. Originally the painting was sold in Paris to an American collector. Jane Peterson was a leading woman post-impressionist painter of the early 20th century. Born in Elgin, Illinois, November 28, 1876, she was interested in art throughout her childhood. In 1895, she went to New York City to study art at Pratt Institute. Before graduating in 1901, Peterson taught painting and became a popular teacher at Pratt. She then became the Drawing Supervisor of Brooklyn Public Schools. She studied oil painting with Frank Vincent DuMond who emphasized a prismatic palette. 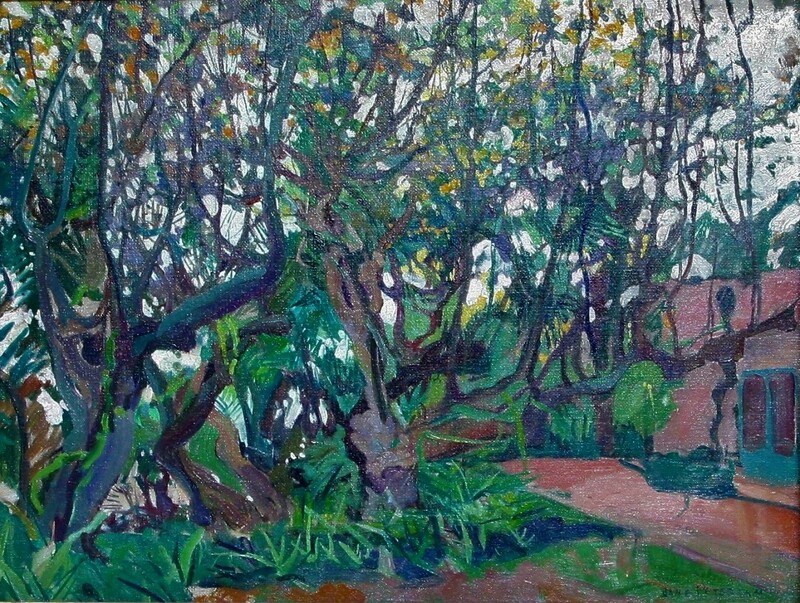 Subsequently she studied painting with Frank Brangwyn in London, Jacques Emile Blanche and André Lhote in Paris, and Joaquín Sorolla y Bastida in Madrid. She was influenced by Impressionism and Fauvism during her studies in Paris. In 1924, Peterson's painting, Toilette, received critical acclaim at the New York Society of Painters. Her one-woman show on Fifth Avenue sold out. By this time, she had won numerous awards, was a Fellow at the National Academy of Design and a member of many art clubs including the American Watercolor Society, Audubon Artists, Pen & Brush Club, and the National Association of Women Artists. In 1925, The New York Times characterized Peterson as "one of the foremost women painters in New York." 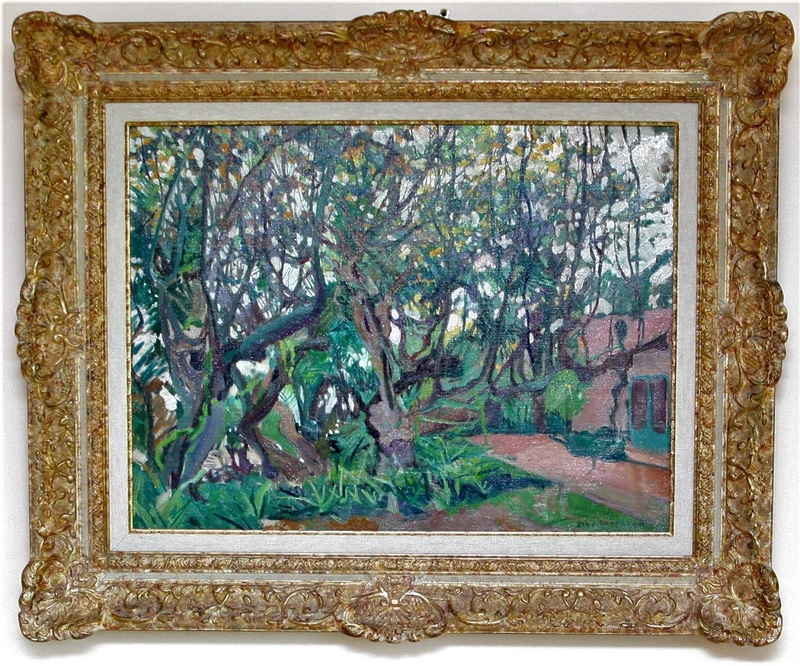 Known for her colorful, post-impressionistic paintings of Gloucester streets and harbor on Cape Ann; palm trees along the Florida coast; street scenes in Paris, Istanbul and New York City; and boating views in Venice. Peterson also flamboyantly executed floral subjects and dynamic genre-like-portraits. Carob Tree (Ceratonia siliqua) is a small evergreen tree of the Mediterranean coasts. It has dark green, compound leaves with glossy, oval leaflets. In Italy, the carob tree blooms from September to November. Its seedpods, also known as Saint John's bread, are up to 45 centimeters long and are filled with round, hard seeds and a thick pulp. St. John's Bread was probably the husks in the Prodigal Son parable, and the seed which is said to have been the original jewellers' carat weight. The Spaniards call it Algaroba, and the Arabs Kharoub, hence Carob or Caroub Pods, Beans, or Sugar-pods. It is also named Locust Pods. These pods are grown in southern Europe for feeding domestic animals as well as for human food. Carob is sold in health food stores, and is often a substitute or alternate to chocolate.